From 6:30-8pm the Cotton Building will become an A Cappella Zone. 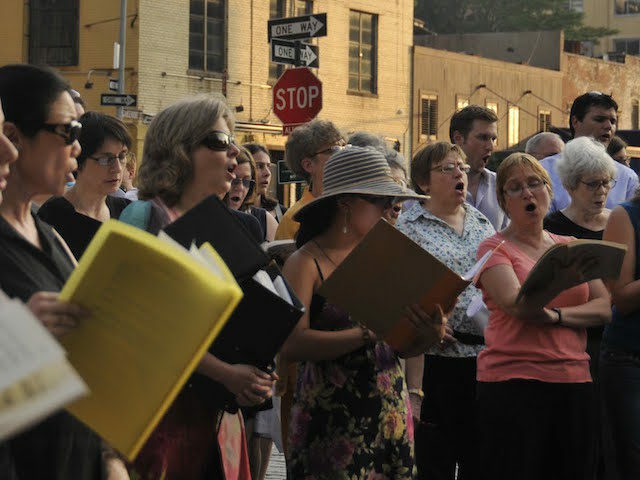 Championing the power of singing for fun, health and everyone, festival director Judith-Kate Friedman will lead circle singing for all at 7pm. In the tradition of Bobby McFerrin and Rhiannon, everyone gathers in a circle and receives simple and more complex parts improvised by the conductor. As the rhythmic, harmonious layering of voices swells, and vocalists of all skill levels get to solo over the sound, even the most shy find their place in the musical tapestry. This improvisational adventure can range and flow in style from jazzy grooves to classic choral moments, from hip-hop commentary to elements of world folk, country, and blues. Leading up to Circle singing, regional choral groups will warm up the crowd with interactive performances.